Although it is very tempting, teach your kids to skip the store-bought microwave popcorn (which has trans fat and artificial flavors) and pop their own instead. 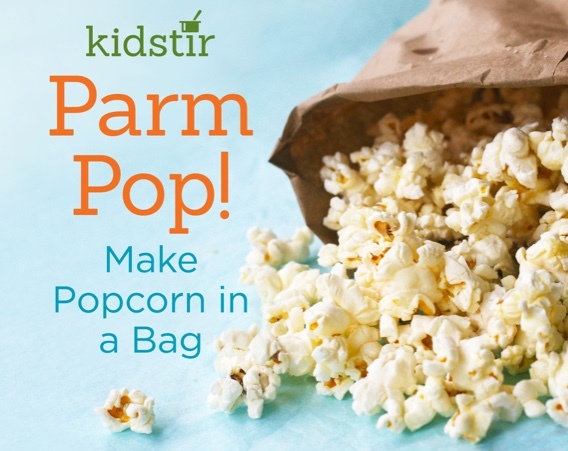 All you need is a paper bag, popcorn kernels, a little olive oil, and Parmesan cheese. The kids will love the Italian flavor blitz! 1. Measure the popcorn kernels right into the bag. Fold over the top of the bag a few times. 2. A grown-up can help microwave the popcorn for 2 to 3 minutes or until the popping sounds almost stop. 3. Carefully open the bag. Drizzle the olive oil over the popcorn. Add the Parmesan cheese and salt. Give the bag a good shake. 4. Taste the popcorn. What do you think? If it needs more salt or cheese, add it to the bag and shake it up. Eat straight from the bag or pour into a bowl.